CHAUVET® DJ, a leading manufacturer of LED lighting, introduced new gear to mobile entertainers during the 2012 DJ Expo. New members joined the SlimPAR™ family of PAR-style wash lights and Freedom™ series of true wireless fixtures, the innovative Obey™ 4 D-Fi™ 2.4 GHz wireless DMX controller complements the Freedom™ series to afford mobile performers a true wireless lighting system and Geyser™ RGB brought atmospheric effects to a whole new level with its pyrotechnic-like effect. The highly anticipated Freedom™ Strip Mini RGBA and Freedom™ Par RGBA joined the Freedom™ series of 100 percent true wireless fixtures. The Freedom™ series features up to eight hours of battery power, while a built-in D-Fi™ 2.4 GHz DMX transceiver and infrared remote control capability allow for complete wireless control. Additionally, Freedom™ Charge S and Freedom™ Charge P, two new roadcases designed to charge and safely transport Freedom™ fixtures, joined the series. To provide a completely wireless lighting solution, Obey™ 4 D-Fi 2.4GHz combines two popular control products into one, easy-to-use controller. A huge hit among attendees and the perfect complement to the Freedom™ series of 100 percent true wireless fixtures, this controller allows you to control an entire lighting system around a ballroom without ever running a single DMX cable. 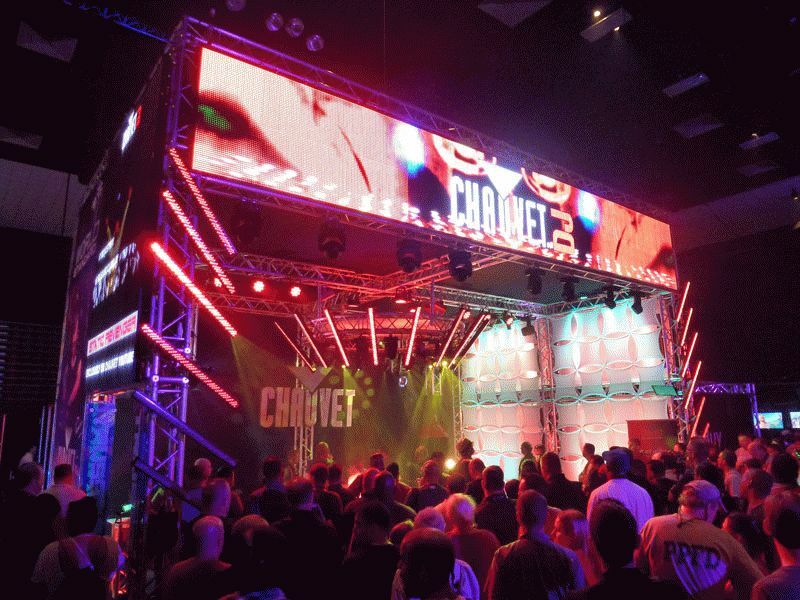 For color mixing or selecting pre-mixed colors, connect any 4-channel LED fixture and set your desired color simply by pressing a button. Eager to add them to their setup, mobile DJs responded enthusiastically to SlimPAR™ Quad-6 IRC and SlimPAR™ Quad-12 IRC joining the SlimPAR™ series of powerful wash lights. Both fixtures feature quad-colored LEDs—including punchy amber LEDs for additional color options—and an infrared receiver to operate wirelessly with an infrared remote control (IRC). SlimPAR™ Quad-6 IRC and SlimPAR™ Quad-12 IRC provide smooth even output, are suitable for on-camera use and feature a 100 percent convection cooling system with silent operation. Geyser™ makes a bold statement and kept attendees flocking to the booth to see it in action. As an effect light and fogger in one unit, it produces intense explosions of color, fog and light. This powerful fogger blasts a vertical stream of safe, water-based fog, while simultaneously illuminating the bursts with 21 high-power, three-watt LEDs. A combination of red, green and blue LEDs allow for easy color mixing.